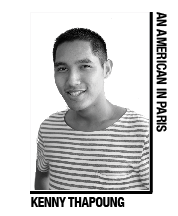 Columnist Kenny Thapoung discovers the differences between men in Paris and the U.S.
I’m sure, no, convinced I will never find “the one” at Temple. Call me crazy, or call me forever single, but I can’t imagine spending the rest of my life with someone who bleeds cherry and white. On the other hand, Paris is a whole new playing field, and I’m catching any opportunity that’s thrown my way. As Q-Chat columnist Brandon Baker said in his column a few weeks ago, it takes more than a simple glance to know whether someone is gay. Most of the time, people automatically assume that if a guy wears skinny jeans or dresses impressively fashionable than your average bro, he’s got to be into dudes. In the fashion capital of the world however, style is not a factor of sexuality. Everybody–teenagers, young adults, fathers–dresses like it’s always Fashion Week. So whenever I hit the Parisian streets, it’s always a game of guess-my-preference. I have to admit my gay-dar hits a three out of 10 on the accuracy scale. If I wander to the Marais and stroll through the many rainbow-painted clubs, it’s pretty obvious what types of men I’ll meet. And in a place like Paris’ Mix Club where foreigners, gay or straight, bob their heads and kick it “Jersey Shore” style, playing I-Spy for that one gay requires persistence. The other night when I flashed my Pennsylvania driver’s license for a free entry in to Mix Club, I owned the stage with dance moves even “Glee’s” Mike Chang couldn’t compete with. But in between dropping it low and picking it up slow, my eyes locked onto my first target. I hopped off center stage and made my way over to him. You’d think that because one-fourth of my body was drowned in alcohol I’d have the guts to introduce myself to the hottie towering over me, but no. In typical lazy American fashion, I let, or rather, encouraged him to make the first move with an accidental bump on the shoulder because I was too afraid of rejection. Naturally he wanted to know what just happened. One word after the next, we were having a full-blown French conversation–success. Eventually we exchanged digits before going our separate ways, but as we said our goodbyes, I headed toward the bar for drink No. 5 when some midget of a man crosses my path and refused to budge until I told him my name. Of course I was flattered when he said he thought I had the prettiest brown eyes he’d ever seen in a blacked-out club, but his wrinkles and his diminutive stature just weren’t up to par, or my forehead. That wasn’t the end of them. I had two more guys approach me without having to even glance their way. I’d expect as much from a gay bar or club but not in a predominantly heterosexual environment. I know it’s cliché to refer to Philadelphia as the City of Brotherly Love, but it has nothing compared to Paris. Never have I been in a place where gay men feel secure enough with themselves in a straight club to openly flirt with another man. French-German (the boy who I tricked into giving me his number) said unlike in America, race and sexuality are nothing more than eye color. People will notice it but won’t enforce any stigma or stereotype to the category. You don’t need to chase them because they’ll come find you and talk to you. And despite what people say, most of the French adore the American accent. I knew I loved the French. Since that little tidbit of cultural knowledge, I’ve been more comfortable going up to complete strangers and chatting about whether they’re gay or straight because they could care less about my orientation. Even if I do get shut down because a guy I think is crazy attractive isn’t into my XY chromosomes, at least we say farewell with a traditional “bisous-bisous”–the staple French goodbye that requires a small kiss on each cheek. I may not go home with these guys, but at least I can say I got to first base, sort of. Kenny Thapoung can be reached at kenny.thapoung@temple.edu.